They will set you back no more than $3. 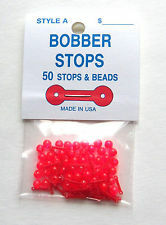 Bobber stops take a lot of time to rig up, so I suggest you get them ready ahead of time. You don’t need to actually use them when you are fishing, you can still “free hand” it (jig), but if you have more than one hole you are in control of, then using a bobber on a ‘dead stick’ is really handy.